These are mostly as I remember them as a kid, so take them less as verified facts and more a window into how a 10-year-old might listen to an athlete. And it should go without saying that my point is here less about the content than by the pitchmen. These stuck with me because they made sense and more importantly because they came (supposedly) from my sports heroes. And they stay stuck with me 20 years later. Cliche? Probably. But impactful to my pre-teen worldview? Definitely. If you find something you love, you’ll never work a day in your life. I can still picture the flipping hall of fame Cardinals shortstop Ozzie Smith saying this at the end of some kid-orientated sports highlights show one Saturday morning. Isn’t that funny how much something I saw on TV as a pre-teen so impacted me? That logic clearly guided my pathway today. Act like you’ve been in the end zone before. This is often credited to Vince Lombardi but in my childhood mind, it was Lions running back Barry Sanders, famed for avoiding end zone dances. I think often about that perspective, just do the work, don’t celebrate and show that you’ve been there before and will be there again. There’s always a bigger challenge to confront. Skate where the puck is going, not where it is. OK, I know, I know, I know. This is among the most overused, particularly in business communities, but the legendary quote from hockey great Wayne Gretzky still stuck with me as a kid. And, yes, I think of it today. To be great, you need to be thinking about what is next, not what is now. Be the best at whatever you want to do. 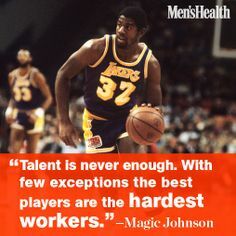 I remember the concept being partially attributed to Magic Johnson by my high school’s athletic director. But helpfully and memorably the excitable Kurt Walton, my high school’s AD, took it further. I was a 13-year-old incoming freshman, and he told a room of us that even if we were going to skip school, we should at least be so inventive and determined at it that no one would know. That logic defines my life even today: I work hard at anything I take on. I offered perspective on how tech communities are growing up adjacent to these communities of need.